At the fabric store a few weeks ago I came across this fun animal print jersey-type material. Right then and there I had one of those ah ha moments. If you haven't already noticed I'm loving fabric stores lately. This is beautiful and so subtle, you can wear it with everything! Nice job!! You are very creative! It is so cute! Enjoy! you are so smart. i love love love love love it. Very cute, I was just at Joann's yesterday and wondering what I want to make out of their gorgeous linen, guess I'll have to go back and find that cute fabric! Fabric stores are in essence like Safari's - always fun to look at the rare and extinct and bring home a memory of some sort from each roving! I could look at fabrics all day, well in fact I did that as a career for years. Attending the "premier visionne" in Paris looking at fabric swatch after swatch was an incredible expedition! You should sell your scarves!!! What a great fabric! Love it. I love that fabric, may have to hunt some down myself! Very inspirational. I love fabrics, but can never decide what to do with them. Thanks for the little photo, I'm off to make scarves now! Awesome. Nothing like a good scarf. very cute! why did I think you were a blonde?? if this were facebook I would click "like"
I actually picked up some jersey the last time I was a fabric shop to try and make my own scarf. I'm trying it out tonight! We shall see. Ah I've been so behind on blog reading can't believe I forgot to enter your give-away! I love the gurgle pot. oooh, so pretty I want one! oo pretty! love that print. i remember when i was little my mom dragging me into fabric stores..now i drag my sophia with me...hehe. Love it. You need to seel these in your Etsy shop! It's so HOT. Looking fabulous Linds! Awesome- I love this pattern. Love it!! The print is fab and so versatile. You and I are on the same track! With my new sewing machine and all...a trip to my local fabric store excites me! Love the fabric, it looks so soft. Again I wish I knew how to sew...Beautiful! It looks good. That happened at our house tonight. Youngest daughter wanted a new scarf to wear, I remembered the scrap of brown gingham I had just purchased and offered it up. She wrapped it and wore it without even finishing the edges. It looked adorable. 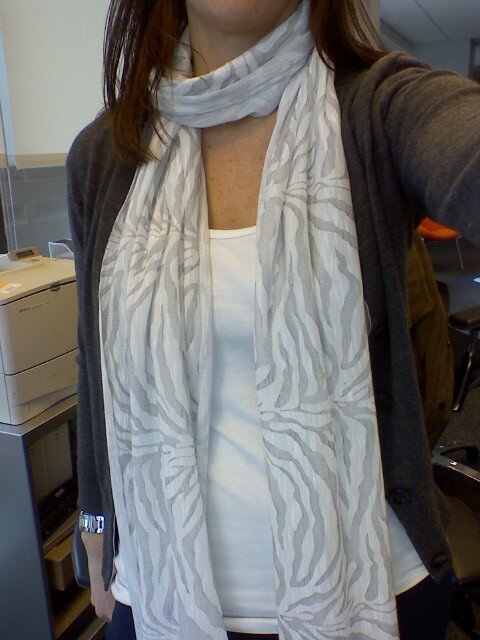 gray, white, subtle animal print... love it! Must learn how to sew, stat. So smart! Did you even have to sew it? Sometimes really soft jersey just has a nice way of curling at the edges for a raw finish. I need to hit up that fabric store, it's so close to me! domestikatedlife- I didnt have to sew it on the edges, it curled up nice and cute. I didnt have a long enough piece to use as a scarf though, so I had to cut the yard I had in half and then sew those two pieces together. I didnt do it right in the middle though, so where the seam is is just off center so when I wrap it around my neck the seam is not right in front but off to the side. If that makes any sense at all :) Basically if you lay it out flat and see where the seam is located, one side is way longer than the other.